Toronto, Ontario--(Newsfile Corp. - March 5, 2019) - Royal Road Minerals Limited (TSXV: RYR) ("Royal Road" or the "Company") is pleased to announce that it (the "Purchaser") has entered into a definitive stock purchase agreement (the "Agreement") with Compañía Kedahda Limited (the "Seller"), an affiliate of AngloGold Ashanti Limited ("AngloGold Ashanti"), to acquire Northern Colombia Holdings Limited ("NC Holdings"). NC Holdings in turn owns Exploraciones Northern Colombia SAS ("ENC") which owns a title package (collectively, the "Titles") comprised of mining concession agreements covering approximately 36,000 hectares of land, and the rights with respect to applications that have been made to acquire mining concessions over approximately 215,000 hectares of land, in prospective mineral belts in the Nariño, Cauca and Antioquia departments of Colombia (the "Transaction"). Increased Future Optionality. 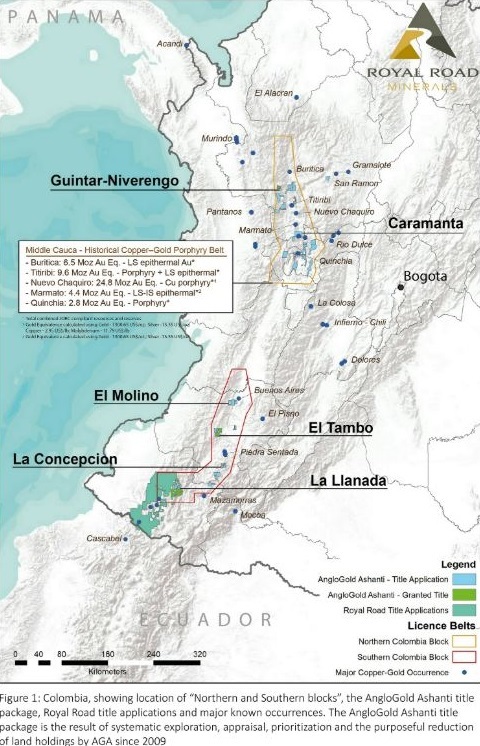 The Transaction will significantly increase the Company's portfolio of potentially Tier 1 exploration assets and provides the Company with various options for joint-venture and cash generating transactions in Colombia. Advanced Exploration Potential. 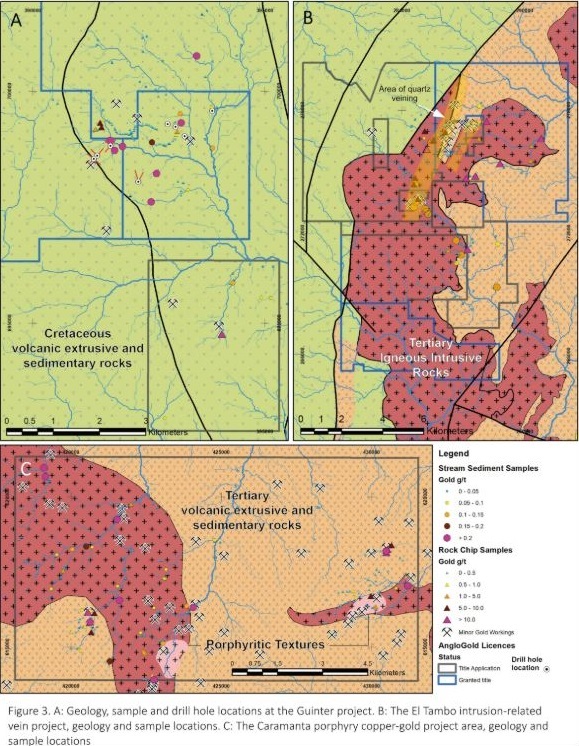 The Transaction provides the Company with access to drill-ready potentially Tier 1 projects on granted concession agreements within its present area of interest and elsewhere in prospective mineral belts throughout Colombia. 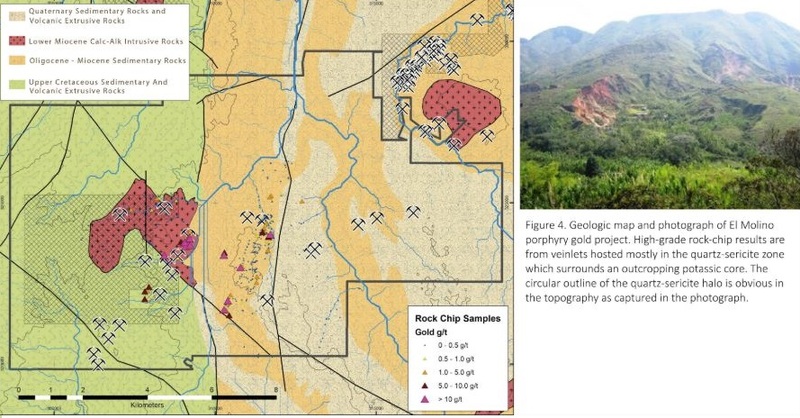 The La Llanada project area in Nariño Province, characterized by very high stream sediment sample results and comprising several currently known high-grade vein-gold systems, (see Figure 2) and surrounding the La Redención mining license, over which the Company has an option agreement and is permitted to drill (see press release dated April 4, 2016). 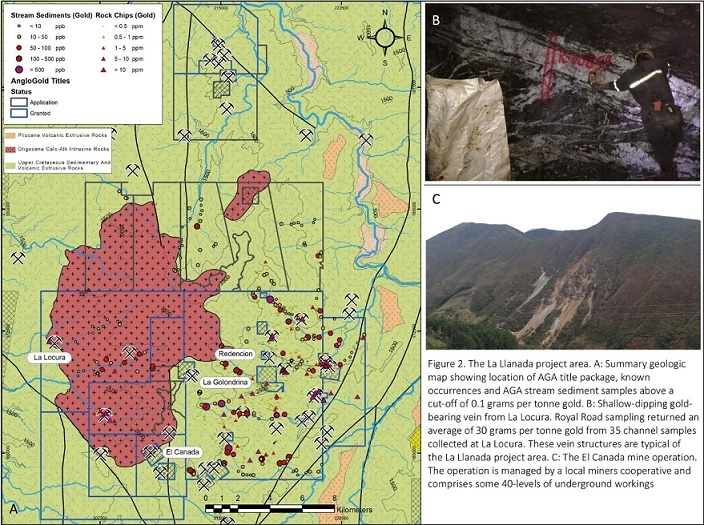 The El Tambo intrusion-related gold project in Cauca Province, where AngloGold Ashanti reported an area of steep-moderate dipping quartz-veins, up to 3 meters wide, over 3 kilometers in strike length and 600 meters in total zone-width and with rock chip results returning up to 77 grams per tonne gold (based on a reported 182 combined panel and grab rock-chip samples ranging from below detection limit and with a mean of 2.2 grams per tonne gold; (Figure 3). The title package contains numerous porphyry-style occurrences and two well-known porphyry copper and gold projects that whilst not drill-ready, will be the short-term focus for Royal Road's social and permitting teams. Further information is available by navigating to the dedicated landing page on the Company's web site www.royalroadminerals.com. Under the terms of the Agreement, the Purchaser agreed to acquire from the Seller all of the issued and outstanding shares of NC Holdings. NC Holdings indirectly holds, through two wholly owned subsidiaries, all of the issued and outstanding shares of ENC, which is the holder of the mineral concession Titles and is the assignee of the rights to any Titles that are granted to AngloGold Ashanti Colombia S.A. (the "Assigning Company"), an affiliate of Anglo Ashanti, pursuant to title applications made by the Assigning Company to the National Mining Agency of Colombia (Agencia Nacional de Minería). a further aggregate amount equal to twenty million dollars ($20,000,000), payable in four equal installments of five million dollars ($5,000,000) on the date that is 90 days following the end of each of the Company's four consecutive fiscal quarters immediately following the commencement of commercial production for the Specific Project. The following information was made available to the Company by AngloGold Ashanti. Sample preparation and analyses are conducted according to standard industry procedures. Rock samples are crushed, split and pulverized prior to analysis of Gold by fire assay and Atomic Absorption and multi-elements by ICP-AES and ICP-MS after four acid digestion. Stream sediment samples are sieved to -200 mesh and analyzed for Gold by fire assay and ICP AES and multi-elements by ICP-AES and ICP-MS after aqua regia digestion. Analytical performance is monitored by means of certified reference materials (CRMs), coarse blanks, coarse and pulp duplicate samples. Surface samples have been prepared, for the most part, in ALS Chemex preparation lab in Colombia and analyses have been completed in ALS Chemex Lima. This news release contains certain statements that constitute forward-looking information and forward-looking statements within the meaning of applicable securities laws (collectively, "forward-looking statements") including e statements relating to the Transaction and those describing the Company's future plans and the expectations of its management that a stated result or condition will occur. Such forward-looking statements involve known and unknown risks, uncertainties and other factors that may cause the actual results, performance or achievements of the Company, or developments in the Company's business or in the mineral resources industry, or with respect to the Transaction, to differ materially from the anticipated results, performance, achievements or developments expressed or implied by such forward-looking statements. Forward-looking statements include all disclosure regarding possible events, conditions or results of operations that is based on assumptions about, among other things, future economic conditions and courses of action, and assumptions related to government approvals, and anticipated costs and expenditures. The words "plans", "prospective", "expect", "intend", "intends to" and similar expressions identify forward looking statements, which may also include, without limitation, any statement relating to future events, conditions or circumstances. Forward-looking statements of the Company contained in this news release, which may prove to be incorrect, include, but are not limited to, those related to the Transaction, the Company and the Company's plans exploration plans. The Company cautions you not to place undue reliance upon any such forward-looking statements, which speak only as of the date they are made. There is no guarantee that the anticipated benefits of the Transaction and the Company's business plans or operations will be achieved. The risks and uncertainties that may affect forward-looking statements include, among others: economic market conditions, anticipated costs and expenditures, government approvals, and other risks detailed from time to time in the Company's filings with Canadian provincial securities regulators or other applicable regulatory authorities. Forward-looking statements included herein are based on the current plans, estimates, projections, beliefs and opinions of the Company management and, in part, on information provided to the Company by Anglo Ashanti and its affiliates, and, except as required by law, the Company does not undertake any obligation to update forward-looking statements should assumptions related to these plans, estimates, projections, beliefs and opinions change.